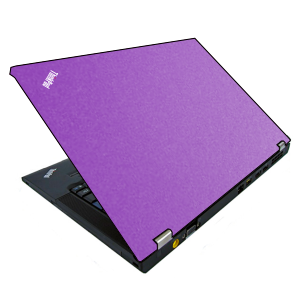 This Lenovo T410 laptop has a custom sprayed lid with a metallic purple finish. To achieve this we have an in-house spray facility to create a colourful finish on the standard matte black Lenovo lids by first spraying a shimmering colour followed by a smooth, clear laquer to increase durability and minimise scratching. This Lenovo T410 features a blistering fast Intel i5 dual core processor and 4GB of memory to boost productivity wrapped in one of the most durable laptop chassis available! Lenovo have a great reputation for solid build quality and this is no exception. The 14-inch T410 follows the standard ThinkPad recipe of a durable plastic enclosure wrapped around an internal roll cage that protects the internal components. The black plastic features a matte finish that is immune to fingerprints. Looking for something with a different specification or fancy a different colour of Lenovo T410 laptops? Click here to view our full range of T410 laptops!